Two wins out of eight games is certainly better than ten losses in a row. 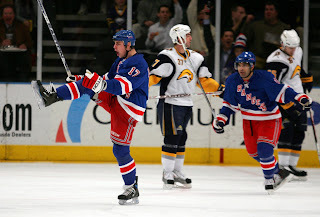 This was the case as The New York Rangers handed the tenth to the Buffalo Sabres last night, obviously hurting without their now-Blueshirt Chris Drury. Though disappointed in Drury's performance as a Ranger this season, I felt satisfied in that we were able to acquire him (big deal! - double meaning), that we finally beat the team responsible for knocking us out of playoffs last season and contributing to their double-digit loss streak - a horrible achievement for any hockey franchise. The win leaves a slightly less bitter taste in Ranger fans' mouths, as we take the win with a 'grain of salt', as this team needs to demonstrate more than a win here or there. Three in a row would get some of us back. I had tickets. I was supposed to be there. Work, work, work. Needless to say, I couldn't be there and I am not able to comment on the game, but was pleasantly surprised by the updating scores through text messages. I highly suggest you link to the following terrific NYR sites for information on the game, including the next two games against the Boston Bruins back-to-back this Saturday and Sunday. 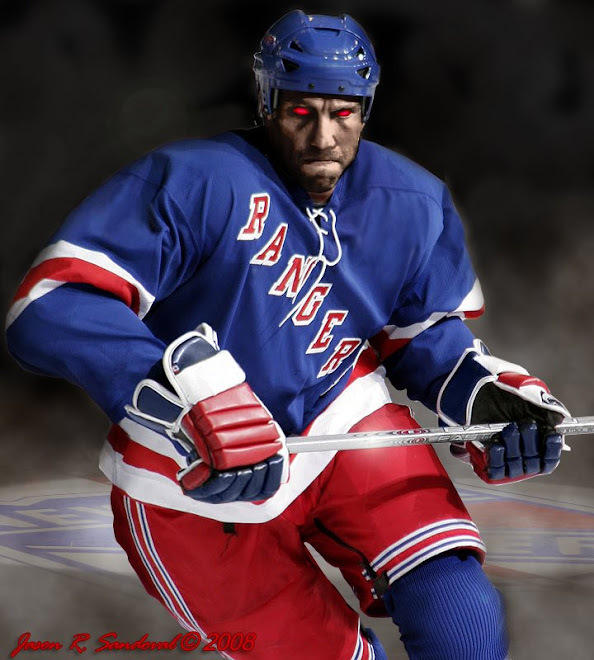 I highly recommend visits to Scotty Hockey, The Ranger Pundit, Pucks on Broadway, Blueshirt Bulletin, or the bias official website NYR. Perhaps one of our guest bloggers will make an appearance on the blog!!? I will not be posting this weekend as The Dark Ranger will be in Toronto researching and meeting with various hockey spies, seeing family, visiting the Hall of Fame and enjoying the company of certain hockey retirees. More to come from the Darkest of Hockey Bloggers on the net. You missed a good game TDR. I will be happy to throw a guest post up this weekend. I will be in NYC Saturday, but at the Coliseum coaching a youth tournament Sunday so I will have some time to type. Don't worry, I have your readers covered!